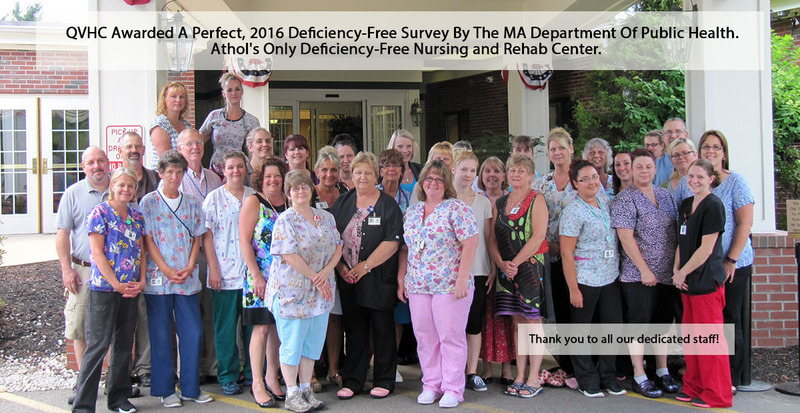 Athol, MA—Quabbin Valley Healthcare is very pleased to announce that it has earned a perfect, deficiency-free survey from the Massachusetts Department of Public Health (DPH). The deficiency –free rating came after the State’s rigorous onsite annual examination and is one of the top indicators of excellence for rehabilitation and nursing care centers. The state surveyed Quabbin Valley Healthcare in mid-June over the course of 4 days for compliance with nursing care quality and environmental standards. They evaluated our facility for quality, safety, administration effectiveness, cleanliness, nursing care, activity programs, protection of resident rights, and food services. During the last three years, the department found only 17 out of 431 nursing homes deficiency-free. Quabbin Valley Healthcare is proud to be among this elite group of nursing facilities. Qaubbin Valley Healthcare is the top-rated center for rehabilitation and skilled nursing in Athol. With increasingly stringent regulations, achieving the deficiency-free rating is exceedingly difficult. These surveys, and the subsequent ratings, are a useful tool for prospective and current residents; their families and health care practitioners, to make informed choices about the quality of a long-term care and rehabilitation facility. Often times patients who require rehab or long-term care services are not given choices, and the best care providers, like Qaubbin Valley Healthcare, are being pushed aside. We want everyone to know, we are here, and we are in fact, the best. Just ask. It takes an entire team effort to achieve this distinguished rating. We have our staff in direct care, nursing, activities, the administration, maintenance, housekeeping, dietary, and our professional medical staff, to thank for such outstanding results. We are very proud of our staff’s accomplishment. Quabbin Valley Healthcare has been providing skilled nursing and rehabilitation care in Athol for close to 60 years. We are the only skilled nursing center in Athol and provide first class, top-rated care. With clinical programs like pulmonary and respiratory rehabilitation, orthopedic and neurological rehabilitation, wound care, pain management, care of medically complex conditions, skilled nursing care, IV medications administration and management, and so much more, Quabbin Valley Healthcare is unmatched in the market. If not given a choice to come to Quabbin Valley after a hospitalization, just ask your social work or case manager at the hospital, and they will help you get information about us. Or, call us directly at 978-249-3717, you can also visit us online at qvhc.com.